Danielle Bradley is a Senior in Moss Adam’s Credits and Incentives group. 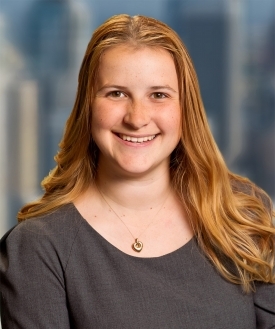 She joined the Seattle office after experience in private industry conducting internal audits and tax compliance work, as well as experience in public accounting at KPMG conducting similar tax consulting work. In her tax consulting work, Danielle has experience with working on many industries including software, aerospace and defense, banking, military/government, food and beverage, music, retail, and healthcare. Danielle graduated from Pacific Lutheran University with a B.B.A in Accounting in 2016 and an M.B.A with an emphasis in Technology and Innovation Management in 2017. Danielle served in many organizations while at PLU, including Beta Alpha Psi, Beta Gamma Sigma, Golden Key, School of Business Ambassador, Student Investment Fund, Phi Kappa Phi, and numerous social clubs. In the Delta Rho Chapter of Beta Alpha Psi, Danielle served as Chapter President and before that Treasurer. She implemented new initiatives and changes surrounding the topic of diversity in the accounting, finance and information systems career paths. One large initiative was a military accounting, finance and information systems resume building workshop which brought in veteran students and those actively serving to tailor their military experience from military to civilian terminology. Danielle is very passionate about representing the students and alumni in the organization and will work diligently in order to make sure that their voices are heard and understood on the Board of Directors. Please reach out with any questions, guidance, or suggestions.